After reading alarming accounts in the news regarding the possibility of widespread food shortages in the near future, President Obama met with key officials in his cabinet to be briefed about possible measures he might propose in order to mitigate the impact on the citizenry. The President had just seen the World Bank’s recently released Food Price Watch report which announced the disturbing news that the Bank’s Food Price Index had gone up by 15% in the three months between October 2010 and January 2011 and is a full 29% above its level a year ago. The U.N. Food and Agriculture Organization further stated that a 30% increase in food prices would be likely next year as well. The President’s advisors explained that a number of factors were at work, and that these were largely beyond anyone’s control, with global warming as the primary culprit. Among causes cited were devastating floods in Brazil, Pakistan and Australia, unprecedented droughts in Russia, Argentina and China and below average harvests in the United States and other countries. Increased demand and domestic inflation resulted in higher rice prices in some Asian and African countries and the diversion of corn for the production of ethanol was also considered to be a cause for increased prices in basic foodstuffs, including beef and poultry. In the United States, it is predicted that this year 40% of domestic corn production will be destined for processing into biofuels. The officials were at a loss as to how to shield the US against this dangerous global phenomenon until Agriculture Secretary Thomas Vilsack reminded the President of the existence of the nation’s Strategic Cheese Reserves, which are stockpiled deep underground in caves in Missouri. This hoard is the result of a longstanding federal program dating back to the Depression Era whereby the government purchased much of the excess cheese that was produced by the dairy industry. Only officials with high security clearances know for sure, but there is said to be well in excess of a million tons stored there with a current market value approaching $9 billion. Secretary Vilsack proposed that this cheese be mobilized and made available to needy people, much in the fashion as food stamps are today. The President’s new Press Secretary, Jay Carney, even went as far as to suggest that Mr. Obama could garner favor among low-income voters by pitching bricks of cheddar from a White House balcony into a crowd of hungry, chronically unemployed, although the group unanimously discounted this idea. The first lady was horrified at releasing the estimated 23 trillion calories stored in the cheese caves to an already overweight public, fearing that this would undermine her “Let’s Move” anti-obesity campaign. However, Mrs. Obama agreed to listen to all of the arguments put forth at the meeting. Interior Secretary Ken Salazar cautioned the President that for some time, the United States Geological Survey had been concerned that increasing underground geothermal activity caused by climate change could heat the cheese to the point where it would melt and violently erupt out through fissures in the rock, and potentially smother entire communities with a scalding yellow ooze. Secretary Salazar suggested that this would be an opportune time to release the stockpiles and clear out the caves, because FEMA would likely be incapable of dealing with a catastrophe of this nature, as their rescue launches would not be able to navigate in a medium as dense as molten cheese, which would quickly clog the heat exchangers on their engines. Prior efforts to mitigate threats to the public and avoid a catastrophic caseous meltdown, numerous federal initiatives have been in place for some years. In 1995, the Department of Agriculture created a non-profit organization called Dairy Management, Inc. It is funded through assessments charged to the dairy producers and the taxpayer dollars and has a mandate to increase demand for U.S. dairy products. Unfortunately, attempts to reduce the vast stores of cheese have only been met with moderate success. According to the New York Times, the best promotional efforts put forth by Dairy Management Inc. and the Department of Agriculture in their 2002 partnership with Pizza Hut in their celebrated 2002 “Summer of Cheese” only resulted in a meager incremental consumption of 102 million pounds cheese, which scarcely put a dent in the 1.3 million tons that are believed to exist in the nation’s underground repository. Recognizing a unique opportunity to solve two worrisome problems at the same time, President Obama and his advisors moved swiftly to put a plan into action. 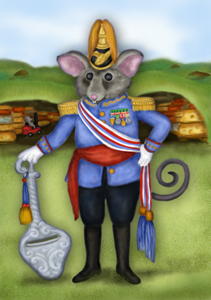 Due to the magnitude and complexity of the undertaking, the President soon realized that it would be necessary to appoint a Cheese Czar to oversee the operation. After consulting his most trusted advisers, Mr. Obama soon settled on his leading candidate, a distinguished industry expert named Al Gorgonzola. Dr. Aloysius Gorgonzola earned his PhD in Food Science from the University of Wisconsin and later spent some time as an Assistant Professor at the Wisconsin Center for Dairy Research. As an articulate speaker and an authority on cheese production and long-term storage, Dr. Gorgonzola fit the bill perfectly for steering America’s cheese policy and running what would soon become a high-profile operation with considerable public and media visibility. Within days of his nomination, the White House held a formal ceremony in the Rose Garden and invited many of Washington’s luminaries to participate in Mr. Obama’s historic conveyance of the prestigious title of Cheese Czar to a beaming Dr. Gorgonzola. When Fox News television host Greta Van Susteren read the White House release, she immediately recognized Dr. Gorgonzola as a fellow Wisconsin cheesehead, and quickly contacted his office to arrange for him to appear on her show, “On the Record” and defend his suggestion that the state’s iconic football team be renamed “The Green Cheese Packers” because they always shoot for the moon.